To add Authorize.Net payment gateway, CIM (Customer Information Manager) must be enabled. Type the API Key & Transaction Key (Which you have received after you signed up with Authorize.Net) in the corresponding fields. It supports payment methods including, Subscription and onetime payment methods including PPV, PPV Bundle and Pre-Order. It doesn't support Muvi Kart. It only supports USD in currency. 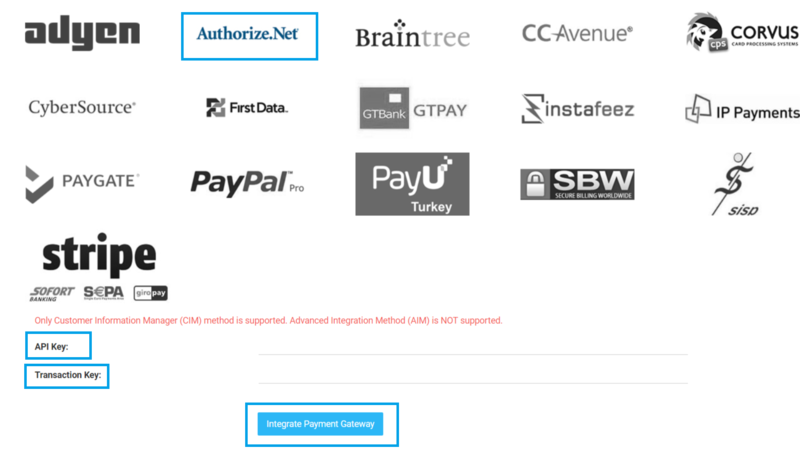 You can create a Sandbox Account to test your payment gateway. After creating the sandbox account you need to provide us the details (i.e. API Key & Transaction Key) to integrate the sandbox account in CMS.